Looking down from the observation deck of Willis (Sears) Tower, the tallest building in Chicago, at the Jane Byrne (Circle) Interchange between Interstates 90 & 94 (Kennedy and Ryan Expressways) and Interstate 290 & IL 110 (Eisehower Expressway). This view looks west, with I-290 & IL 110 (CKC) bee lining toward the western suburbs. Photo taken by Steve Hanudel (05/14/06). Interstate 290 is a conglomerate of several highways constructed in different eras. It begins at Interstate 90 in Schaumburg and heads south toward Addison along the IL 53 corridor. The route turns southeast once it meets Interstate 355, the Veterans Memorial (North South) Tollway. I-355 parallels IL 53 south to Downers Grove and Joliet while I-290 continues to Elmhurst and Berkeley. A southeasterly trajectory takes I-290 adjacent to U.S. 20 (Lake Street) to IL 64 (North Avenue) and I-294 (Tri State Tollway). I-290 and I-294 parallel one another south for 2.2 miles to the village of Hillside, where the I-290 forks eastward to merge with the east end of Interstate 88 (Ronald Reagan [East West] Tollway). The Tri State Tollway stays on a southern heading to Hinsdale and I-55, where it curves southeast to I-80 and South Holland. Advancing toward Chicago, the wye interchange where I-88 & IL 110 (Chicago Kansas City Expressway) combines with I-290 represents a bottleneck where five lanes of eastbound traffic reduce to three. Beyond the congested merge point, IL 110 (CKC) overlaps with I-290 as the freeway winds east between the villages of Bellwood, Broadview and Maywood to IL 171. Following the original Congress Expressway, which was renamed the Dwight D. Eisenhower Expressway, I-290 separates Concordia and Forest Home Cemeteries at the Des Plains River in Forest Park. The below grade, six-lane freeway extends east from there through the village of Oak Park to enter the city of Chicago at Austin Boulevard. The Eisenhower Expressway is one of the oldest freeways in Chicago. It runs between the South Austin and Lawndale neighborhoods initially to Near West Side, the Illinois Medical District and University Village / Little Italy. Interstate 290 & IL 110 meet I-90/94 at the Jayne Byrne (Circle) Interchange just west of Downtown Chicago. The freeway continues a short distance east of the exchange as a city parkway into the Loop. Known as Congress Parkway, the limited access highway transitions into a surface boulevard beyond the tunnel below the Old Chicago Post Office. The surface street portion of Congress Parkway ends at the foot of Buckingham Fountain in Grant Park, just shy of U.S. 41 (Lake Shore Drive). Interstate 90 routed along the Congress Expressway in 1960. Map courtesy of Peter Johnson. 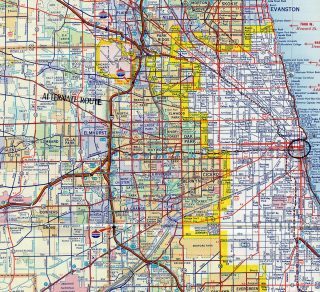 Early Interstate plans for Chicago took I-90 southeast along what is now I-290, I-94 along the Chicago Skyway to the Indiana Toll Road, and I-294 east from the Tri-State Tollway along side I-80 & 90 to Lake Station, Indiana. 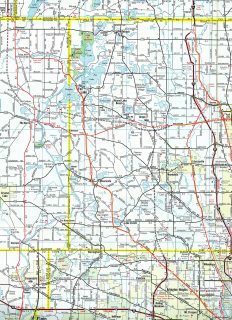 1971 General Drafting Map showing the proposed routes for both unconstructed IL 53 and U.S. 12 through Lake County. 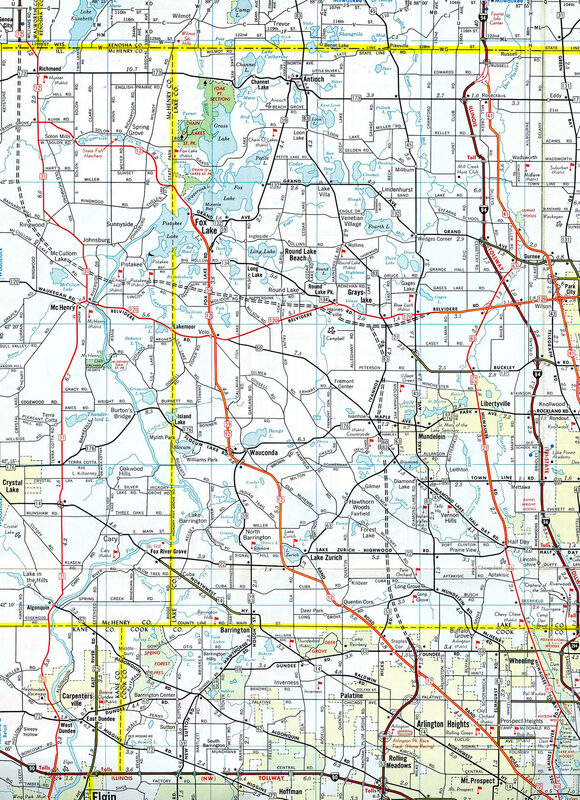 Had Illinois 53 been completed as a freeway north to U.S. 12 at Grays Lake, and U.S. 12 subsequently from there west to McHenry and north to Genona City, Wisconsin, the corridor might have been a candidate for a long distance extension of Interstate 290. This concept is purely speculative. Interstate 290 is very tightly routed through the western suburbs and through Chicago’s West Side, with very little room for any kind of expansion. 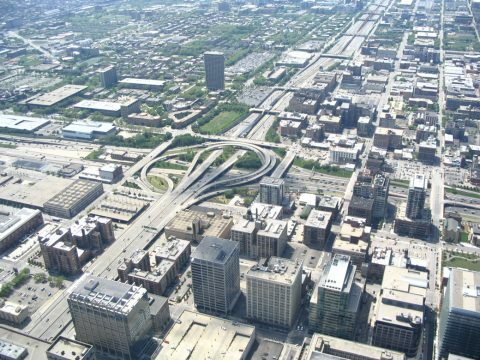 The Congress Expressway was an pre-Interstate system freeway, and it follows the route of Interstate 290 from Downtown Chicago west to Interstate 88 (Ronald Reagan Tollway) & IL 110 (CKC) and Interstate 294 (Tri-State Tollway). The Eisenhower Expressway was numbered as part of transcontinental Interstate 90 once Interstate Highway System markers were placed on Chicago&apos;s expressway network. However, during a major renumbering of the Chicago metropolitan expressways in 1978, as approved by AASHTO on July 6, 1977, Interstate 290 replaced I-90. Interstate 90 was relocated to the John F. Kennedy Expressway and Jane Addams (Northwest) Memorial Tollway via Interstate 94 and Former IL 194. This renumbering also resulted in the redesignation of IL 594 (O&apos;Hare Airport Spur of Kennedy Expressway) as Interstate 190. 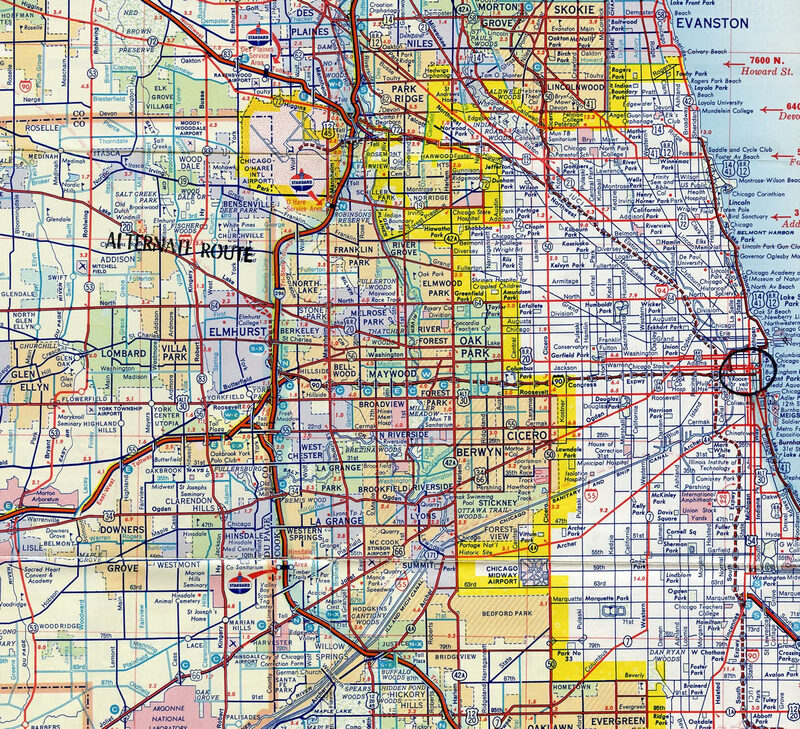 The idea was to provide a more direct Interstate 90 corridor from the Northwest Suburbs to Downtown Chicago. Interstate 290 and IL 53 run concurrently from the village of Itasca, just north of the I-355 end, to I-90 (Jane Addams Memorial Tollway). IL 53 extends as a freeway north from the I-290 end through the city of Rolling Meadows, and around the village of Palatine, to Lake Cook Road. The remainder of the route northeast through the village of Long Grove travels at-grade. Long standing plans for IL 53 included lengthening the freeway north to an extension of the U.S. 12 freeway southeast from Wisconsin. These plans however have met stiff opposition from community leaders in the affluent Lake County suburbs. One plan called for building a portion of the IL 53 route as a 45 mile per hour parkway, while others called for no build alternatives. The one-mile advance sign for Interstate 90-94 (Circle Interchange) along Interstate 290 (Eisenhower Expressway) east appears after the Paulina Street / Ashland Avenue off-ramp (Exit 28B). Photo taken 09/02/05. Eastbound Interstate 290 approaching Interstates 90/94 (Dan Ryan and Kennedy Expressways). The Eisenhower Expressway mainline shifts onto Congress Parkway, which leads into Downtown Chicago. Photo taken 09/02/05. Traffic partitions into three lanes for both I-290 east to Congress Parkway to the Chicago Loop and I-90/94 for the outbound Kennedy and Dan Ryan Expressways. Photo taken 09/02/05. Interstates 90 & 94 combine through Chicago north to Irving Park and south to Greater Grand Crossing. Visible to the left is an El line (Chicago&apos;s version of a subway) running down the center of the Eisenhower Expressway. Photo taken 09/02/05. Leavinvg the Jane Byrne (Circle) Interchange, the Eisenhower Expressway transitions onto Congress Parkway. Photo taken by Dan Garnell (08/28/03). Approaching the Old Chicago Post Office, the first exit on eastbound Congress Parkway is with Canal Street. Photo taken 09/02/05. The Canal Street street off-ramp departs from Congress Parkway just ahead of the Old Chicago Post Office onto parallel Harrison Street. Photo taken 09/03/05. Three lanes continue east along Congress Parkway below the Old Chicago Post Office into Downtown Chicago. Photo taken 09/03/05. Congress Parkway emerges from the Old Chicago Post Office and spans the south branch of the Chicago River on a drawbridge. A loop ramp follows to South Wacker Drive and Franklin Street as the freeway ends at Wells Street. Photo taken 09/03/05. This diagrammatic sign shows the succeeding ramps for both Franklin Street and Wacker Drive. Lower Wacker Drive follows the east bank of the Chicago River South Branch to U.S. 41 (Lakeshore Drive). Congress Parkway extends as an at-grade roadway below the Chicago Stock Exchange after Wells Street. Photo taken 09/03/05. Crossing the Chicago River South Branch, Congress Parkway advances west toward the Jane Byrne (Circle) Interchange with I-90/94 and Interstate 290. Photo taken by Steve Hanudel (05/14/06). Congress Parkway passes under the Old Chicago Post Office with three through lanes. Photo taken by Steve Hanudel (05/14/06). Entering the turbine interchange with the Dan Ryan Expressway (I-90/94 east) and the Kennedy Expressway (I-90/94 west) on Congress Parkway westbound. Interstate 290 and the Eisehower Expressway take over and extend through the Near West Side of Chicago. IL 110 (CKC) also begins here. Photo taken by Steve Hanudel (05/14/06). Interstates 90 & 94 (Dan Ryan Expressway) inbound meet I-55 just one a half miles south of the Jane Byrne (Circle) Interchange with I-290 (Eisenhower Expressway). Photo taken 09/02/05. Passing over several Metra transit lines, I-90/94 (Dan Ryan Expressway) west approaches Exit 52B to Roosevelt Road and Exit 51H with Interstate 290. Rising beyond the sign bridge is Willis (Sears) Tower, which through the latter part of the 1970s and 1980s held the distinction as the tallest building in the world. Photo taken 09/02/05. Two lanes wills separate from the inbound Dan Ryan Expressway for the outbound Eisenhower Expressway. The Circle Interchange marks the transition of the Dyan Ryan into the John F. Kennedy Expressway, which follows Interstates 90 and 190 northwest to O&apos;Hare International Airport (ORD). Photo taken 09/03/05. Interstates 90 & 94 west maintain three lanes as they continue north by the Chicago Loop (Downtown). Photo taken 09/03/05. Exit 51H departs the inbound Dan Ryan Expressway for I-290 (Eisenhower Expressway) & IL 110 (CKC) west and Congress Parkway east to the Chicago Loop (Downtown). Photo taken 09/03/05. Exits 50A to Ogden Avenue (former U.S. 34-66) and 50B to the Ohio Street freeway spur depart in quick succession from the inbound Kennedy Expressway. Seven off-ramps line I-90/94 eastbound to the Jane Byrne (Circle) Interchange with Interstate 290 at Exit 51H-I. Photo taken 09/04/05. A half mile north of I-290 & IL 110 west on I-90/94 east. Prior to the reconstruction of the Kennedy Expressway, there were many on and off ramps connecting with both sides of the freeway. The left exits were a design feature unique to the both the Kennedy and Dan Ryan Expressways in the immediate vicinity of the loop. Most left exits were removed from the inbound Kennedy Expressway, though several left entrance ramps remain. Photo taken 09/04/05. Exit 51G rises from the Kennedy Expressway inbound to Jackson Boulevard east just ahead of the turbine interchange joining I-90/94 with I-290 (Eisenhower Expressway) west and Congress Parkway east. The Kennedy Expressway ends as the Dan Ryan Expressway carries I-90/94 outbound toward the South Suburbs and northwest Indiana. Photo taken 09/04/05. I-90/94 east at I-290 & IL 110 (CKC) west and Congress Parkway east. Congress Parkway continues a short distance to the Chicago Loop and Grant Park. The Eisenhower Expressway departs the city limits of Chicago six miles to the west. Photo taken by Chris Patriarca (05/26/03). Interstate 90 lies 1.25 miles beyond the last mainline exit along Interstate 290 westbound with IL 58 and IL 72. Photo taken 09/03/05. I-290 west & IL 53 (Eisenhower Expressway Extension) north reaches Exit 1B for Illinois 72 (Higgins Road) and Illinois 58 (Golf Road). Photo taken 09/03/05. Continuing north toward Interstate 90, I-290 & IL 53 expand into a local/express lane configuration. IL 53 extends north of Interstate 90 as a freeway until the Cook-Lake County line. Photo taken 09/03/05. The local lanes connect with I-90 (Jana Addams Memorial Tollway) and IL 62 (Algonquin Road). The express lanes bypass the exchange with I-90 north to Kirchoff Road and beyond. Photo taken 09/03/05. Three lanes separate for both roaddways along I-290 west & IL 53 north ahead of the cloverleaf interchange with Interstate 90. Photo taken 09/03/05. Exit ramps from the local lanes to Interstate 90 are unnumbered. Departing first is the ramp for I-90 (Jane Addams Memorial Tollway) leading southeast to O’Hare International Airport (ORD) and Chicago. Photo taken 09/03/05. Passing over the Northwest Tollway mainline, Interstate 290 formally comes to an end. A loop ramp follows for I-90 west to Rockford. Photo taken 09/03/05. The previous end sign assembly for Interstate 290 west at I-90. Photo taken by Don Hargraves (11/02). The first sign of I-290 appears along Illinois 53 south of the cloverleaf interchange with Euclid Avenue. Photo taken 09/03/05. Illinois 53 partitions with a two-lane collector distributor roadway for Interstate 90 (Jane Addams Memorial Tollway). Three lanes extend southward onto Interstate 290 and the Eisenhower Extension. Photo taken 09/03/05. Entering the full cloverleaf interchange with the Jane Addams (Northwest) Tollway on the IL 53 southbound c/d roadway. Interstate 90 lines the toll road west to Elgin and Rockford. Photo taken 09/03/05. Interstate 290 begins as traffic departs for I-90 east to the John F. Kennedy Expressway and Chicago. I-290 & IL 53 combine south to Exit 4 at Schaumberg. The city of Schaumburg is locally famous for the three-level Woodfield Mall, one of the largest in Chicagoland. Photo taken 09/03/05. Westbound Interstate 90 (Jane Addams Memorial Tollway) at Arlington Heights Road, 2.5 miles ahead of I-290 east and IL 53. Photo taken by Brian Dowd (11/28/02). Interstate 90 runs along the north side of Ned Brown Preserve on the one mile approach to Interstate 290 & IL 53 (Eisenhower Extension). Photo taken by Brian Dowd (11/28/02). Crossing over IL 58 (Golf Road) and Salt Creek along I-90 (Northwest Tollway) west ahead of the collector distributor roadway to I-290 east and IL 53. Photo taken by Brian Dowd (11/28/02). A two-lane c/d roadway branches from Interstate 90 westbound for I-290 east to Itasca and I-355 (Veterans North-South Tollway) and IL 53. IL 53 extends north from the tollway as a freeway to the Cook-Lake County Line. Photo taken by Brian Dowd (11/28/02). Traffic departs from the I-90 c/d roadway for IL 53 north to Rolling Meadows, Arlington Heights and Palatine. Photo taken by Brian Dowd (11/28/02). Westbound at the loop ramp for I-290 east & IL 53 south to Schaumburg, Addison and Elmhurst. Photo taken by Brian Dowd (11/28/02). Two miles ahead of the full cloverleaf interchange with I-290 & IL 53 on Interstate 90 (Jane Addams Memorial Tollway) east. Photo taken by Don Hargraves (11/02). Interstate 90 runs along the north side of Schaumburg to the exchange with Interstate 290 (Eisehower Extension) east and Illinois 53. Photo taken by Brian Dowd (11/28/02). Guide signs preceding the c/d roadway separation on I-90 partition interests to Chicago along both I-290 east to the Loop and the continuation of the Jane Addams Memorial Tollway south for O’Hare International Airport (ORD). Photo taken by Brian Dowd (11/28/02). Two lanes depart from the Northwest Tollway mainline for the c/d roadway to Interstate 290 east and Illinois 53. Northbound Illinois 53 leads to the northwest suburbs, while southbound continues on the east side of Schaumburg to other western suburbs. Southbound Illinois 53 ultimately ties into Historic U.S. 66 and connects to Joliet, the seat of Will County. Photo taken by Don Hargraves (11/02). A two-lane exit from I-90 east joins Interstate 290 east to the Eisenhower Expressway, one of the oldest expressways in the city. Photo taken by Don Hargraves (11/02). timeline/eisenhowerx.html, Chicago Public Library, updated February 2006. Kuznicki, Scott. “I-290 update: OPENING SOON!” Online posting, misc.transport.road, September 24, 2003. "Circle Interchange renamed in honor of former Mayor Jane Byrne." Chicago Tribune, August 29, 2014. “Old Chicago Main Post Office receives landmark designation.” The Architects Newspaper, April 16, 2018. "$500M Makeover Plan For Old Post Office – Work to Begin Immediately." Gold Coast Realty – Chicago web site. “Inside the old main post office, a $600 million ‘blank canvas’.” Chicago Tribune (IL), September 27, 2017. “Old main post office owner lands $500 million construction loan.” Chicago Tribune (IL), December 19, 2017. Page updated June 10, 2018.